First lets begin with the bread. The wonderful, easy bread. This round did not come out as well as the first one. I tried to go all organic this time and I am not sure that the yeast was good (please no yeast jokes :)). It never bubbled after sitting there for at least 18 hours. Any suggestions on this one? It still came out beautiful and it was good, just not as light as the first one. To answer some of the concerns about the bread, it is intimidating reading the recipe. It took me many, MANY months to make the recipe. I was nervous about the wait time, but you just have to dig in and make it happen. I just wiped it together before dinner and then forgot about it until the next day, no problem. I am an instant gratification kind of girl, but making this bread, I love! Oh, you ask yourself why is there a picture of a perfectly whimsical cake? Well let me tell you dear reader and friend. 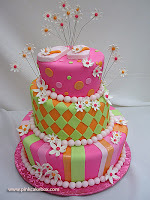 That is the cake, or a version of the cake, that I will be making dear sweet BellaRose for her 1st birthday come May 22. It is my goal. I am determined. I am searching out cake baking classes to take, and I have ordered a book. Now I know that she will never really know that I made her this cake except in pictures, and I know she will never really even eat it, but comepletley destroyit, but don't you see the beauty in that. It is exactly what you are supposed to do on your first birthday. Sure she will have a sugar overdose, but what the heck, you only turn 1 once. Carpe Diem!! BellaRose was sitting on the guest room bed yesterday while I, of course, was on the computer. Worth's guitar was on the bed too, and BellaRose worked so hard to get to the guitar. She loves music so much. She is always beating on the things, and singing. She just started strumming away on the guitar. I got some real cool pictures. I was showing Worth the pictures, asking him if he thought that they were good. He says, well you left the pick in the strings, she won't be able to hear how it sounds. I like the pictures, the artistic side of them and he sees a pick in the strings. Oh well what can you do? And finally, our beloved sippy cup. I got BellaRose a sippy cup because she always seems so interested in my water. She LOVES her sippy. She sees it and those legs start a flappin'. She likes to lounge with it, of course she likes to lounge anywhere. If she is eating, there is always a foot up on the tray. She might not really "get" how to drink from the cup though as you can tell from the middle picture. Thanks for joining me today, I know it is a lot to take in for a thursdsay morning, but you sure have been a good reader. Talk at you later. There is not much to report. I made bread the other day. The No-Knead bread thatKatie (you can find the recipe by clicking the link) makes. It came out beautiful. I tried to take a picture with my camera, but the strap was wrapped around the table end and the camera fell to the floor, landing lens first, jamming the lens. Our nice wonderful camera, crashed to the floor. Luckly I had another lens I could use, but did not have time to go find it, so I took pictures with my cell phone. For some reason my cell phone is being stubborn and is saying the file is too big to send to my e-mail. So kneadless (haha) to say there are no pictures of this gorgeous bread. Which, by the way, was a huge hit. I was really scared by this recipe, but there was nothing to be scared about. I will be making this bread, A.LOT! Thank you KatieKate ! My cell phone would allow me to e-mail these cute pictures of BellaRose though. I had to go wake her up the other day, which I don't like to do, but I did manage to get these sleeping beauty pictures. Look at those legs, you can come squeeze them if you want! ok, ok, ok.......I know I always put up a million pictures of BellaRose, but how could I not? Look at this little baby. I just can't help myself. Sweet Baby turned 8 months old yesterday. I don't know how much she weighs or what her length is. All I can tell you is we weighed her a couple of weeks ago at the Tabacco Barn on this old antique scale and she weighed a whopping 15.1 lbs. My little bean!!! BellaRose and I had a photo shoot this morning because I realized we don't have any pictures together, mostly b/c I would much rather take the pictures. So here are a couple, there are some pretty funny ones, maybe I will put those up later. Not much to report, we are all healthy, Fianlly! Worth has work, his hand is much better, life is good. There is one thing on my mind right now as I sit and write this to you, and that is our sweet girls name. I just don't know how to convince people to call her BellaRose and not just Bella. Now if you call her Bella, I am not pointing you out and I am sure we have individually had discussions about this matter, but what about when I am introducing her to people? They ask me her name, I tell them BellaRose, and they say "oohh Bella, how sweet". I hate saying "this is BellaRose, one word". That just sounds silly. I know there are millions of people out there with a double first names, but I find myself having a hard time conveying that message. Both names are equally as important to me for different reasons (and of course people, Grandma!). So tell me, how do I get across that her name is BellaRose and not just Bella? Taken with the camera phone. so we entered BellaRose is the "Cutest Baby Contest" on Regis and Kelly! I know we are "those" parents, but come on look at her, she could win. Plus it is $125,000 toward college so I figured "what the heck" I will give it a shot. The contest ended on the 11th and voting is in Feb. I will keep you posted so you can vote :). Worth got a drum out for Sweet Girl. I think that she liked it. She likes anything that makes a loud noise. Oh and to let you know she has not gotten sick, yet! Keep praying that she does not b/c sickness has been all around her. My sister-in-law got strep the day after she watched BellaRose b/c her kids had had it. I called the doctor's office and they said children under 2 typically don't get it, so that was great news! today is "Big Daddy's" birthday! Worth, my man, is 33! I wonder how he feels having such a young wife in her 20's still :)? Worth and I first started "dating" a couple of times but one of the 1st times he was just 24! can you believe it and now here we are years later settled down, with a house, a baby, and 2 dogs. Life is Beautiful indeed. I continue to love Worth more and more everyday. his hands that are so strong that can build beautiful things and yet be so gentle when he is holding our Sweet Baby Girl. I never thought I could love him more, but the day we had that Baby I knew it was possible. I hope you have a wonderful day dear sweet husband of mine. I am sorry that I won't be well enough to make you breakfast or even dinner, but once I can function that will happen! I love you dear sweet man! Update~well to give you any indication of how I am feeling it is 3:28 in the morning. I gave up on sleep b/c I can't get comfortable, my throat still kills and my neck is so stiff. I know it sounds like a lot of complaining, and I am sorry. The good news is I don't have a strep. The good news is also what wonderful family I have. As I told you my mom came yesterday with chicken soup and to take care of BellaRose. Thank you! My sister-in-law is taking her tomorrow, er I mean today! Just keep praying that sweet baby does not get this. It keeps me up at night worrying that she will. i must remind myself that according to 20/20 i live in the happiest place in the US. thats right Asheville was voted happiest place in America. I think that you will need to remind BellaRose too. Right now she is sitting on the floor whining, i am sitting her typing with my throat killing me and my ear about to rupture off of my head as we wait for my mom to come and take care of us! She is bringing homemade chicken soap and i forsee a head rub in the near future. Praise the Lord. We are happy though. My baby is not sick, and I pray (and you too!) that she does not get whatever I have. I am heading to the doctor in a minute and I hope to get some good stuff to knock this out. My sister told me that because I am still nursing B-Rose is getting all my immunities and leaving me with not much, so hopefully she has the stuff to fight this sickness. I guess this is why this is the worst I have felt in all the years Worth and I have been married. But don't feel sorry for me b/c my mom is here and I live in the happiest place (said with only the tiniest bit of sarcasm). Sweetie Baby wants to be in the gang! Can BellaRose be in the Read-Along-Gang? I know I am a little behind in this weeks reading so I think that BellaRose is going to read it for me and give me a little book report on it. She has a vast knowledge of the English language already. We gave B-Rose a bath in the tub for the 1st time yesterday and she loved it! She is still so little so we have been giving her baths in the tub that fits in the sink. I decided to give her a bath in the "real" tub because she loves to sit up so much and splash around. She is SO funny in the bath. I think that she could stay in there for days. I have a great weekend. We will be having family over to celebrate Worth's birthday that is on Tuesaday. The big 33! What an old man right :)! He will hopefully get stitches out today. His hand is swelling back up and we don't know why. He is going to an actual hand doctor so hopefully he will have some answers for us. Keep him in your prayers. We will talk at you later. We are on the mend! We are on the mend around these parts and we could not be happier. Worth's unexplained fever has now gone. He went to the hospital twice, as you know, and the doctor twice. He had blood work and flu testing done. There really is no answer besides his hand probably had a slight infection and he might have picked up some sort of virus in the waiting room of the hospital. So far BellaRose and I are doing fine so prayerfully we did not get any of the sickness. It feels so good for all of us to be healthy. Sweetie Baby is on the verge of doing something big, we can just tell. She is getting antsy and squirmy, and she wants to be on the move. We think that crawling will be in the near future and our world and house will be forever changed. I was telling Becky the other day that no one day is the same as the other with a baby. I think about that a lot. She is changing daily. I can't believe she is 7 1/2 months old. Our lives are constantly ebbing and flowing. Through tragedy, sickness, health, happiness, life goes on, babies continue to grow and get strong. Before we know it she will be walking and talking. I think we are ready, if not it will happen anyway. Let the games begin! This is a picture of Worth's thumb today. I finally can share a picture of it for all the world to see. It is getting better. It is still pretty gross looking and he can't feel some parts, but it seems all major tendons are okay. Thank you for all of your prayers. We feel very blessed to have friends and family like you in our life! oh my there is really so much to tell. I have almost been avoiding this post because the list and pictures of things to share is unreal. first lets start with the tree. as you can see after we took all the decorations and lights off of the tree this is what was left. note that is not a tree skirt below the tree but all the needles. yup, ALL the needles. I filled 2 large ziplocs of the needles for next year for scents and then almost filled a 5 gallon bucket of needles. Now do you believe me about how dead this tree was? I have never seen a tree like this. Next on the list is my boldness. I was bold in the face of adversity. I can talk a big gane to people I know but when it somes to confrontation with people I don't know I ALWAYS walk away and then later think of all the things that I wanted to tell them. Not this time folks. I knew what I wanted to say, and said it. I did not walk away. You want to know why? Because my baby was involved, that is why. My momma bear instincts came out. Here is as much of a short version as possible. Worth and I were in the parking lot of World Market and Target just to name a few of the stores. We were getting ready to leave. Worth was putting BellaRose in the car on the right side. I was getting in the drivers side. Of course when you are putting a baby in the carseat you will have the door wide open. Well there was an empty spot on that side, so the door could be wide open, no problem. Let it also be noted that there were tons of empty spots. Well as Worth was putting BellaRose in the car this woman comes flying in the spot and slams on her breaks throws her arms in the air when she sees our car door open and HONKS ON THE HORN!!!! I am yelling this to you. Who does that? Oh man I was on fire. Without a second thought I fly to her side of the car and tell her "NO YOU PARK SOMEWHERE ELSE! HE IS PUTTING A BABY IN THE CAR! YOU MOVE!". Worth gets out of the car at this point and just stares at her. She proceeds to pull in the spot! She almost takes out our mirror in the process. There is a girl in the next spot over who is using some choice words about what I should say to this woman, and tells me it is better me then her b/c she would not have handled it so well. Needless to say the lady did not get out of her car until we and the other girl had left. Worth and I were both shaking when we left. I kindly told the woman "MERRY CHRISTMAS". Worth has asked me not to share pictures of this next story. He chopped his thumb with an axe the other night while he was cutting kindling for an outdoor fire we were going to have. He comes into the house with his hand tripping blood saying he is okay. Ben, Noah, and Bill ended up taking him to the emergency room and after 3 hours of waiting he got 7 stitches. New Years Eve he started to get a fever and went to bed. We had a small gathering at our house and poor guy was in bed the whole time. New Years day rolls around and he has a temp. of 102 and decides to go back to the hospital b/c there was fear of an infection. When he gets there they put him on an antibiotic drip and think that he might have to stay over night. Thankful he did not, but he is not doing so well still. We think he might have gotten sick on top of this all. I feel so bad for him. 4 days of fever and a stitched up hand, that is all black and blue. 2008 is starting out a little rough. like I mentioned we did have a little gathering of people to our house for New Years Eve. It was a blast other then Worth being in bed. Will was cracking us up, running around with a remote in his mouth. His girlfriend was fast asleep in her crib so we had Will all to ourselves. Margaret and I brought in the New Years with some "Hurkies". I have no idea how to spell that, but I am talking about a cheerleading jump :). The top right picture is New Years morning. Rainy decided she would sleep with Ben on the air matress. Ben moved when he woke up with his bottom on the floor, but Rainy thought she would stay. She did not seem to care that she too was on the floor, just as long as she was close to Ben. New Years day while Worth was in the hospital it started to snow and we woke up the next morning to a couple of inches of snow(snowy picture top left). It was so wonderful, but way too cold and windy for BellaRose to go out in it, although Atticus loved it. He just looks right in the snow! Rainy is loving that B-Rose is eating Cheerios as you can see from the picture in the high chair. Well thanks for reading this and sticking it out through the end. I know it is a lot to take in! Happy 2008. Hope yours started out a little better then ours!